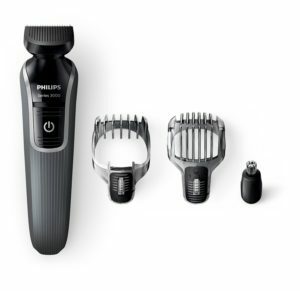 Philips makes some of the best beard and body trimmers out there and the QG3332/23 Series 3000 4 in 1 waterproof men’s grooming kit in no exception. These products can also be used as hair clippers, stubble trimmers and beard trimmers and thus have more than one functionality. With the use of these electric trimmers beard or stubble becomes easier and it can be done all by yourself without going to the salon. It is a 4-in-1 trimmer and can serve many purposes such as full size trimmer, nose trimmer, stubble and beard comb and detail comb. So, as you can see, it is versatile in its functionality. It is water-proof and can be easily used while taking a shower. It is usable up to 60 minutes without any cords, once it is charged for 10 hours. So it can serve as an on-the-go trimmer, or have enough time to groom your entire body. It is easy to wash and you just need to keep it under cold water flowing through the tap. It comes with a two-year warranty from the manufacturer for exchange or repair. These are skin-friendly and gentle. They can trim your beard with perfection just in the way you want. You can trim up to any length and give yourself newer looks each day thanks to the four attachments. It has up to 18 different attachments to choose from for length for 1mm to 18mm. You can try out different styles for your beard, moustache and sideburns using it. The self-sharpening blades are made using finely ground Chromium steel which is long-lasting and durable. The blade tips and combs are appropriately shaped so that they do not cause any kind of irritations to the skin. It can be easily cleaned by rinsing under the faucet. You can use it to create clean and sharp lines along the ages of your beard. One can also remove unwanted hair from your nose using it. You can trim your eyebrows and sideburns to get a completely changed look. The blades reduce friction and are much more durable than other models. It has a nose trimmer attachment, beard trimmer attachment, and hair attachment, and the full size trimmer. The head twist-on mechanism of the trimmer gets worn out with time. As a result, the head might start to vibrate as soon as the trimmer is turned on. It is not a good everyday trimmer since the charging time is long. On a comparison of price and versatility this trimmer comes in very high, and is well worth the money for all you get. It currently has 4.2 out of 5 stars, and 83% of reviews are 4 stars are higher. If you use this for trimming you will be able to trim any hair you desire.